Jim loved working with drummers (like Buddy Rich) going back to his animation and experimental film work in the early 1960s. 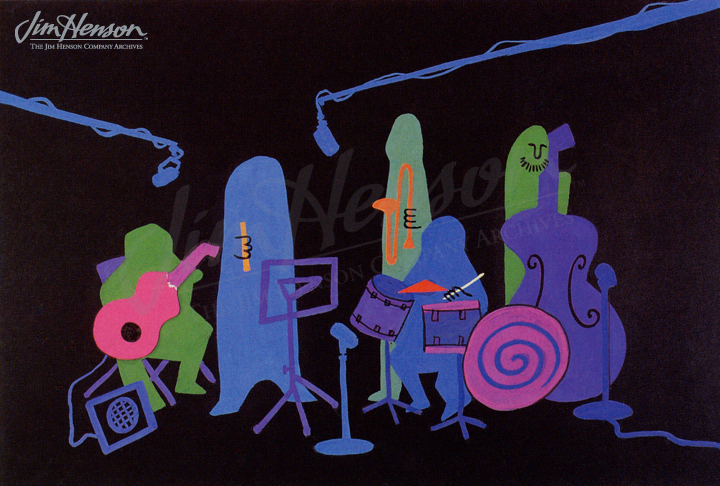 For a few of his animated films, he collaborated with celebrated jazz drummer Chico Hamilton to compose a score. Around 1962, Jim used one composition for two different animated pieces, “Cat and Mouse” and something labeled “Shearing Animation.” About a year later, Jim was developing another jazz-related animated film. He taped audio with Hamilton and created a credit sequence featuring stylized musicians. He never finished the film, but did settle on a title, “Look Jazz, See Jazz” after trying out various other ideas in his editing notebook: Jazz Impressions, Jazz Sensation, Visual Jazz, Cool Doodle and Doodle Dee. For his acclaimed short Time Piece in 1964, Jim brought in big band drummer Ed Shaughnessy to play the score and Dave Bailey to appear as the drummer on camera. 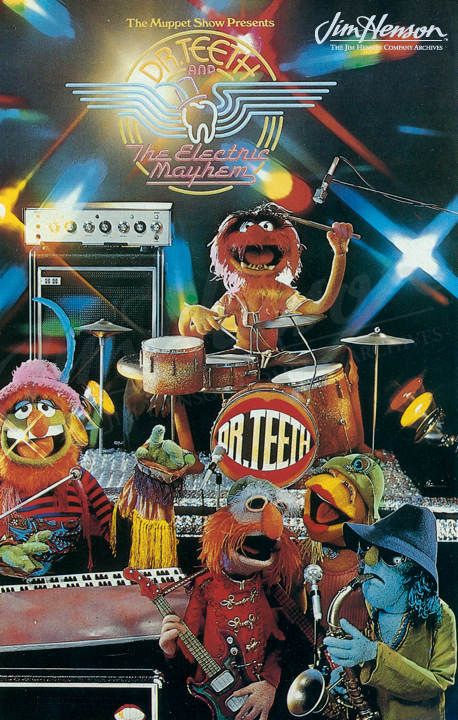 Throughout the 1960s and 1970s, the rhythm track was an important part of many Muppet appearances. When it came time to create a house band for The Muppet Show, Jim knew just the sort of drummer he wanted. 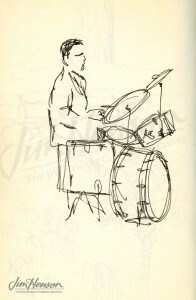 In an early proposal, he had described him as, “a three-handed drummer” and his later concept sketches showed an unkempt, wild-looking talent. He got Animal, of course, played wildly by Frank Oz, and set him in several situations where he could highlight drumming. Animal had a drumming duel with Harry Belafonte in Season 3, with a spirited but happy ending. Animal’s drum battle with Buddy Rich in Season 5 ended differently – Rich clearly had more stamina and his solo left Animal panting and staring helplessly. In frustration, the Muppet drummer hurled his instrument at Rich, crowning the guest star in a comic finale. See Jim’s animated piece “Shearing Animation” with a score performed by the Chico Hamilton Quintet. 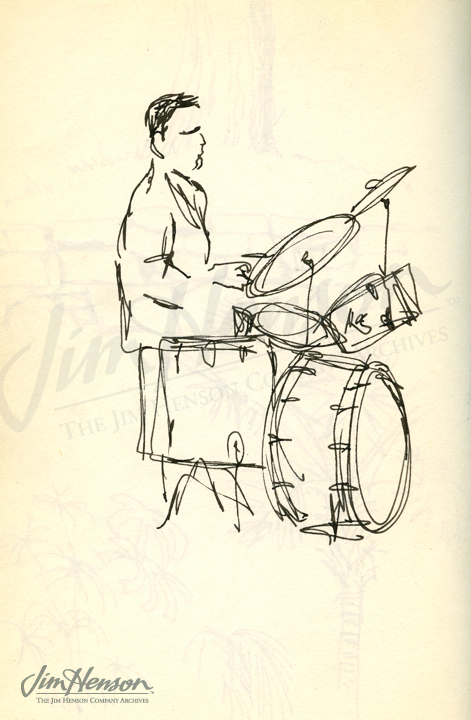 Jim’s sketch of the drummer at WRC-TV in Washington, 1959. Animal with Dr. Teeth and The Electric Mayhem on The Muppet Show. This entry was posted in 08-August '80 and tagged Animal, Buddy Rich, Cat and Mouse, Chico Hamilton, Dave Bailey, Ed Shaughnessy, Frank Oz, Harry Belafonte, Look Jazz See Jazz, Muppet Show, Shearing Animation. Bookmark the permalink.